In 2015, the Nevada Legislature approved funding for a start-up medical school at the University of Nevada, Las Vegas. The overarching plans for the School of Medicine are to design and construct a new building to accommodate 240 students, faculty and support staff. The anticipated timeline for the permanent facility is five years. In the interim, to meet the accreditation requirements and to begin accepting and educating students, TSK designed and provided construction administration services for a temporary facility within one of UNLV’s existing buildings on the Shadow Lane Campus in downtown Las Vegas. 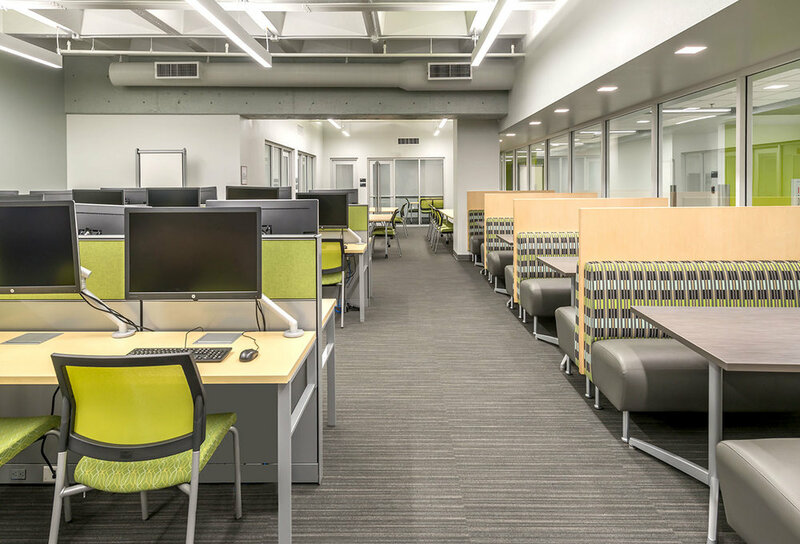 Understanding the temporary nature of the interim space, the design needed to strike a balance—being mindful of the budget, but creating flexible, elegant spaces to provide quality-learning environments that would attract students and faculty to the new program. Where possible, the spaces utilized existing structure, partitions and services. The design used existing roof monitors to bring daylight to the core of what is a windowless, landlocked tenant improvement space. The design emphasizes transparency and the exposed structure to give a sense of height, lightness and space in rooms that have vertical constraints. A restrained color palette with vibrant accents was carried through all of the design elements (walls, flooring, furniture, and acoustic treatments), to create energetic spaces that would foster collaboration and group learning. The scope of work to meet the functional requirements of the school included renovating 16,115 square feet of space on the third floor of an existing building on UNLV’s Shadow Lane Campus. The space needs included a student lounge, fitness center and locker room, three 20-student classrooms, student organization and faculty offices, a 72-seat lecture hall/computer classroom, a virtual anatomy lab, and building systems support spaces. The School of Medicine interim space occupies a portion of the third floor of a building that also houses UNLV’s dental education program. We organized the tenant improvement in a manner that would provide a unique, identifiable image for the School of Medicine. In order to maximize the use of space, we organized the program elements along a central spine corridor. At the heart of the central circulation space is the Information Commons, which maintains transparency into the corridor to create a sense of openness and space, and to foster the sense of activity and collaboration although the physical space is limited. 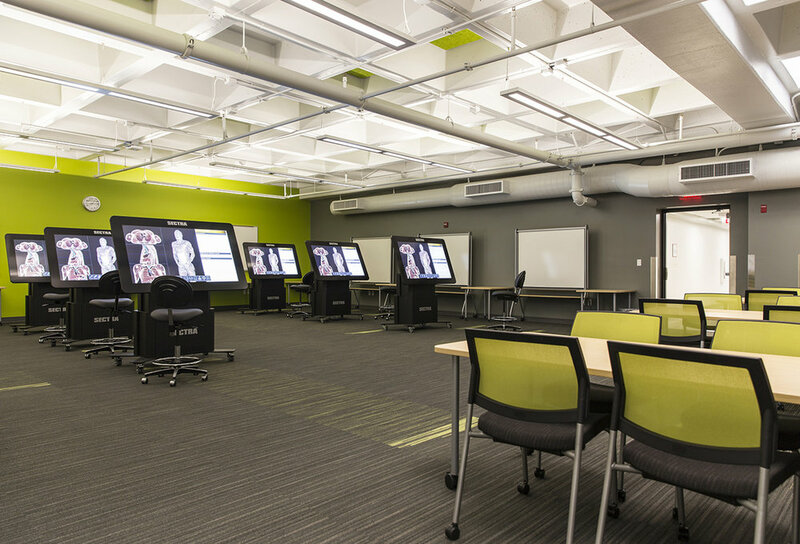 The use of existing, raw materials, color and transparency creates contemporary, open, dynamic spaces that support the school’s vision of providing cutting-edge medical education for a new age of medicine.